If it's July 4th weekend at the box office, it must be time to blow up the world again. Fireworks ignite in the box office as well as outside it as we reach the halfway point of the year, with a film from arguably the biggest director and star in Hollywood arriving in theatres. For anyone involved with War of the Worlds, it's been kind of a good news/bad news past few weeks; the movie has been in the news, on entertainment press and in the trades virtually every day. However, it's been because of the increasingly bizarre public spectacle that is the Tom Cruise and Katie Holmes Show, and more recently, Tom's ill-advised and widely ridiculed remarks about the mental health profession. Steven Spielberg is likely working overtime on the voodoo doll, but to obviously little effect. Celebrity meltdowns aside, it is still a big-budget summer movie with plenty o'splosions, the world's most famous director, and one of the biggest stars in Hollywood. It should be bulletproof, at least on opening weekend, as Spielberg knows how to bring the spectacle. This adaptation of H.G. Wells's classic science-fiction novel about an invasion of Earth by Martians places the action on the ground, as it happens. In the middle of it all... one man... trying to save his family... *cough* sorry, slipped into trailer-speak for a minute there. Anyway, Tom Cruise is our ostensible hero as a working class father trying to survive the invasion with his daughter (played by Dakota Fanning, legally bound to be in mortal peril in all her films). 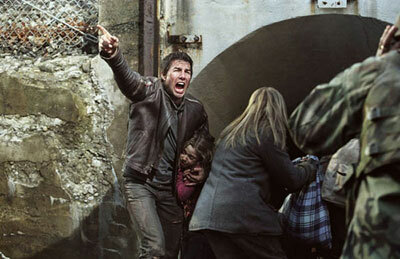 This is Spielberg and Cruise's second teaming as you might remember, after 2002's Minority Report. That opened to a "Was it worth it?" $36 million and finished up with $132 million, which is not the sort of result you'd expect for an action film with two names like those two. Spielberg then made two movies in a row with Tom Hanks; one which did quite well, and another that was one of his few box office misses. Cruise has since had The Last Samurai and Collateral, which both did okay - Samurai slightly underperforming and Collateral maybe doing better than expected, though with a smaller overall number. Both of them are clearly looking for a home run. With near rapturous reviews and slick action-packed trailers, that seems to be in the cards as a huge summer tentpole film for DreamWorks. However, it is unquestionable that Cruise's antics have turned some, if even a small number of people, off the film. With a six-day opening period that stretches the plausibility of the term "weekend", War of the Worlds should be in for a figure of around $115 million over that period. About $70 million of that should come from Friday to the July 4th Monday, with the balance prior to the holiday. The only other wide release film of the weekend is Rebound, although if it were to adequately describe the career of its star, Martin Lawrence, it would be titled Free-Fall. In the film, Lawrence plays a high-profile college basketball coach who, after exploding during a game, is banned from the sport. The only offer he can get is from a junior-high basketball team, where he hopes to prove he's changed, so he can sell out again and go back to guiding young student-athletes through one, or maybe two, full years of college. We've seen a few similar films to this recently, with the most recent being Mr. 3000 starring Bernie Mac. Other similar movies are Hardball, and if you really really stretch, The Bad News Bears. Obviously, this film is hanging on the comedy stylings of Mr. Lawrence, who must make three calls a day to Michael Bay about Bad Boys 3. After the breakthrough role in Big Momma's House, his next three films fell without much fanfare, averaging about $35 million total. Bad Boys II was a return to box office success but can hardly be credited to him. Rebound looks about as unfunny as his trio of shame and should open to about $12 million over four days. Bucking the trend of the past few weeks, some of last week's returning films were able to hold on to more than 50% of their box office. Batman Begins may just turn into a success after all, and has earned about $125 million to date. Mr. & Mrs. Smith started acting like the fan-favorite film we all thought it should be, and after three weekends, has earned about the same figure. Both are in for a tough ride against Worlds, but should be helped along by the holiday weekend. Look for Batman to earn another $19 million over the four days of the weekend, as Smith another $14 million. Other returning films might not be so lucky, as Bewitched is quickly gathering the stink of failure around it. Audiences just can't be made to care about films about Hollywood, even with the wacky antics of Will Ferrell and comely lasses like Nicole Kidman. It should bring in another $12.5 million this weekend but may lose steam very quickly after that. Herbie: Fully Loaded has a shot with kids out of school, but I don't know if I'd count on that, with Lindsay Lohan now appearing on the cover of Career Suicide magazine. Give it another $9-10 million. As wonderful as it is to see George Romero making zombie films again, Land of the Dead is not likely to have much impact beyond its opening weekend. Over the four-day weekend, it should bring in $6-7 million more, but horror has not had much in the way of legs lately. We incidentally have more zombie action opening this weekend, with the Australian gore film Undead, debuting on New York and Los Angeles screens.